Anyway, today we decided to take a day-walk to the Orongorongo River primarily to try out my new shoes and to increase my level of fitness. So, we hopped in the car and drove over to Wainuiomata a little after lunchtime. We arrived at the Rimutaka Forest Park at about half past one and immediately started on our mini trek to the River. The Orongorongo Track is very different from the Waiohine Gorge walk we did last weekend. The ascent isn’t as steep and the paths are wide and somewhat well defined (I wasn’t using roots as steps and didn’t have to look for orange markers). According to the signpost, it’s about 2 hours to get to the River (per way) and, after last week’s debacle, that sounded like a walk in the park. We (me and my tramping companion) managed to walk about 3/4 of the way but, due to inclement weather, had to turn back before we reached the river itself (thus, the incomplete blog post title). The weather wasn’t looking flash this morning really, and we did expect a bit of rain however, we could have forged on if we had our proper tramping gear on (see fashion attire in previous post) but we didn’t and we didn’t want to risk getting drenched on the way to the River and even more drenched on the way back. It would be quite uncomfortable moving around in soaking wet denims and cotton jerseys. So, we walked briskly (and jogged a bit) to the carpark and called it a day. We’ll do this walk again (and complete it) sometime in the not-so-distant future. One good thing about going on an easy tramp / walk is that you can really stop and take pictures. Here are a few taken en route to the River. No, we didn’t walk far enough for me to have sore feet. I did, however, feel my toes getting sore again. No, not because of the new shoes. I ended up NOT wearing them today because I haven’t properly “treated” them yet. They would be more prone to damage if I expose these to the elements without it being waxed and primed. 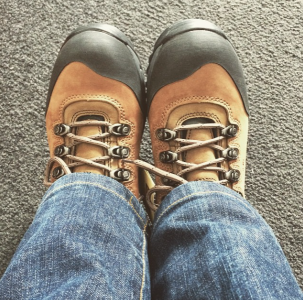 So on this walk, I wore my old tramping boots – the one that gave me grief last week. I’ll definitely wear the new ones on our next walk. Next Next post: Wicked Wickets!